When our phone battery gets drained in places where we can’t really get hold of a power socket, a power-bank comes really handy. But what if your power-bank too gets exhausted of all its charges and it may take quite a while till you get to a place where you can charge your phone? To ease out this problem, there is a new product in the market known as SOScharger. This is basically a normal 2300 mAh power-bank, but the feature that makes it separate from a normal power-bank is the ability of generating charge by simple hand-cranking. The product has a lever on one face of it which works as a hand crank. 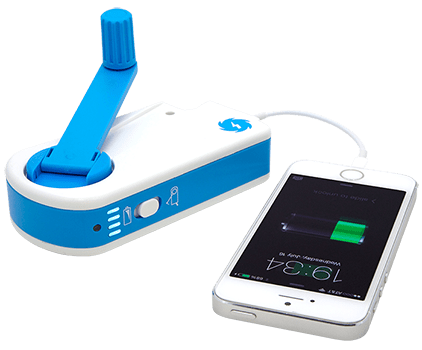 In case of power failures, you will just need to connect the product with your phone or other device and hand crank the lever to get your phone charged. You can also use it as a normal power-bank under usual circumstances. This particular aspect is not very new in the market. It has been quite a while that hand-crank chargers have come to the market. With the product, comes an obvious question: why SOScharger? First of all, the product is outright portable. The other hand-crank chargers come in bulky and heavy shapes and to carry them in your pocket is literally impossible, but this SOScharger weighs only 7 ounces and has a shape just like the iPod. The portability of SOScharger can be defined as one of its greatest USP. Secondly, this SOScharger can charge up any product which can be charged via USB port. Unlike most other products of this stature, SOScharger can even charge your Kindle and Bluetooth headsets too with its normal output of 5V 1A as normal USB standards. Third point is the amount of effort that you need to put while charging your phone. With this SOScharger, you will need to hand-crank the product for about 3 to 5 minutes to get an average of 10 to 12 minutes of phone usage time. This is a pretty good statistic compared to the hand-crank charger from Sony which gives you only a minute of phone usage time for each 3-4 minutes of winding the device. Last but not the least; the product is cheaper than other such products available in the market. You can get it by spending about $25 to $35 from the open market or from online stores. So, get your hands on the SOScharger and go on camping or hiking without the tension of draining the battery life of your phone completely. This product will also become an insurance of your phone battery in case of any kind of unfortunate power outage during any natural or man-made calamity in future.